You know… it practically doesn’t matter which phone you have these days. Regardless, there’s probably an “app for that.” If you want to see the JoshuaProject.net data on your phone, get the JP Mobile app. 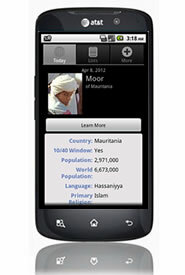 If you’d like to see the Unreached People Group of the day, get the JP Unreached app. And if you’re into languages, get the JP Languages app (which lets you see lots of cool language resources that relate to various unreached peoples). They’re all free, but they’ve all come at a great cost: lots of loving hours of dreaming and programming time. Learn more by going to the app marketplace for your phone and searching for Joshua Project. 11) Free 150-page Presentation Explains your Tech Worker’s Mind	9) What do you think of Online TEFL Courses?